The best Sonos alternatives for multi-room audio | What Hi-Fi? "If I want a wireless multi-room speaker system in my home, is my only option to go to Sonos?" It's not your only option - but we can see why Sonos might tempt you. The company reigns supreme in the multi-room market, thanks to its easy-to-use control app (crucial to the multi-room experience) and its extensive, unrivalled support of streaming services, iOS and voice assistants. And on top of this, the Sonos range of speakers also sounds good. It's this marriage of convenience, features and performance that has seen it win countless What Hi-Fi? Awards and remain the go-to multi-room system. But it's not the only ecosystem out there. Sonos's popularity has sparked dozens of competitors - and the advent of smart speakers and voice control has produced more options when it comes to sending and controlling music wirelessly around your home. We've rounded up a number of alternatives, some of which offer a different flavour of sound or a different set of features compared to Sonos. Hopefully there's something for everyone. The first of these is a newly-crowned What Hi-Fi? Award-winner and relatively newbie in the multi-room market: Audio Pro. We're big fans of the Swedish company's individual wireless speakers (which have separately picked up plenty of Awards), so we aren't too surprised a multi-room system made from their superb speakers - Addon C3, Addon C5 and Addon C10 - sounds great. What surprises us more is how its musicality is unrivalled by anything else at a similar price - or even, in some cases, quite a lot more. Such is the appeal of Audio Pro's expressive, nuanced and precise performance, we prefer it - in pure sound quality terms - over the more established Sonos and Bluesound systems. Audio Pro's simple app can be a little buggy (and isn't anywhere near as fully featured as Sonos's, granted) and the system doesn't support hi-res, but if pure musical enjoyment is your priority, this multi-room system is currently unbeatable. The first genuine threat to Sonos was Bluesound, whose key hook of high-resolution audio support made it our preferred multi-room system for years (as multiple Awards trophies attest). Its wide range of products (which includes wireless speakers, streamer, amplifier and soundbar) and rich, punchy sound made this pricey system worth investing in. But that was before Audio Pro came into the picture with its superior sound for less money. Now in its third iteration, Bluesound is a solid-sounding system despite losing its fifth star, with an improved BluOS app that makes daily use a breeze. If you have deep pockets and a library full of hi-res music, it's worth a punt. Bluesound's current line-up includes Pulse 2i, Pulse Flex 2i, Node 2i, Powernode 2i and Pulse Soundbar 2i, and you can add older Bluesound models into the mix, too. Fancy an alternative hi-res-supporting system? The refined-sounding Denon HEOS does hi-res audio, including DSD 5.6MHz files. What about Amazon Echo speakers? Here’s a question: if the Sonos One and Sonos Beam incorporate Alexa voice control, is there really any reason to buy smart speakers such as the Amazon Echo for your multi-room system? There is, and for one main reason: price. 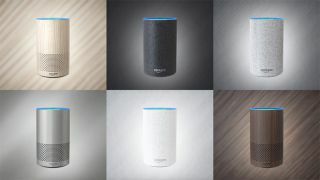 Amazon's multi-room-supporting Echo speakers - Echo (first gen), Echo 2, Echo Plus, Echo Dot - don't hold a candle to rivals when it comes to sound quality, but they're all considerably cheaper than the entry-level products from Sonos or Audio Pro. With the current Echo 2 costing just £90, it's more affordable to dot these speakers around your home than the Sonos One (£199) or Addon C5 (£229). With Amazon Echo speakers now supporting Spotify (along with Amazon Prime Music, Amazon Music Unlimited and TuneIn radio) across multi-room, it has an attractive and immediate appeal to casual listeners who want a house filled with music without spending too much. And there are even more new Amazon products on the horizon: a second gen Echo Plus, a new Echo Dot, a brand new Echo Link Amp, the Echo Dot Input and the Echo Sub - all trying to muscle in on the home cinema market. Google's own smart speakers (Google Home and Google Home Mini) support multi-room just like Amazon's Echo speakers, but we wouldn't recommend them on their own - they have poor sound quality. What we would recommend instead is Google Chromecast: it's a streaming method built into a range of products – Android devices, TVs, soundbars, AV receivers, wireless speakers - from a variety of manufacturers. It means you don't need to stick to one brand to go multi-room; you just need to have the compatible products (such as a Sony or Philips TV, B&O Beoplay A6, JBL Playlist, Sony STR-DN1080 amp) and make sure they're connected to the same network. Then simply press play on your iOS or Android device to 'cast' music to your connected products. You can also bring in your old hi-fi separates into the mix using the £30 Google Chromecast Audio dongle, which also supports hi-res music. Then simply group your connected products in the Home app, press play on your iOS or Android device, and control them just as you would a Sonos system. Looking for another mix-and-match option? DTS Play-Fi is a third-party app (that's nowhere near as slick as Sonos's) that lets you link select products from manufacturers such as Arcam, Klipsch, Martin Logan, McIntosh, Pioneer, Onkyo and Polk for multi-room streaming. This one is strictly for Apple users only. AirPlay 2 - Apple's proprietary streaming protocol - finally brought multi-room capability to its products in the summer of 2018. A multi-room system built out of Apple's HomePod smart speaker is the obvious choice here: it's easily the best-sounding speaker of its kind (surpassing the Sonos One in audio performance) and Siri works with Apple Music beautifully. But it's also pricey, and HomePod doesn't natively support any music service - not even BBC radio stations - apart from Apple Music. AirPlay 2, however, is supported by plenty of heavyweight hi-fi brands, including Bowers & Wilkins, B&O, Dynaudio, Denon, Libratone, Marantz, Naim, and yes, even Sonos. Of course, it only works with Apple's iPhone, iPad, iPod and MacBooks as a source - which isn't a problem if you're an iOS user, but it means Android users can't join in on the fun. You do get to choose from some superb-sounding hi-fi kit, though. So if you've fully invested in the Apple ecosystem, you might want to consider a mix-and-match approach using AirPlay 2-compatible speakers for your multi-room system. Or, if you're wedded to Apple Music and are okay with eschewing extra features for an all-Apple experience, multiple HomePods isn't a terrible idea.